***I received a Litter Genie system as a member of Crowdtap. I was not required to write a post for my blog, but choose to share our experiences because of my genuine enthusiasm. Momma Told Me: You wanted the cat, now take care of the cat. Pets are not only companions, but lessons in responsibility. For some, starting with a plant or a goldfish is the best idea, for young children and newly married couples, adopting a new kitten or puppy can be a good test of one's commitment and maturity. Just like a child, pets bring immense joy and many memories as they grow and bond with their parents. Unlike human kids, pet parents will be required to dispose of and handle their pet's waste throughout their entire lives. I once asked a close friend of mine about the type of kitty litter she used and how it performed. I still remember the look she gave me, as if I were bringing up a taboo topic. But every pet owner knows that Everyone Poops, there's even a book, if you don't believe me! So why don't pet owners spend more time about making this unpleasant part of pet parenting more tolerable? When we first brought Truffles home she was the runt of her litter and hardly weened, but she knew where her litter box was, and how to use it. As a home. Poor Truffles had come from a chicken farm with dogs ten times her size, and was covered in fleas. While she was provided multiple safe places to hide, it was the giant litter box she took refuge in. At about 4 month old I began to train her to use the (human) toilet with a litter system that worked like a charm. For almost half a yer Truffles used the spare toilet to do all of her unseemly business. Then, one day, she decided she no longer liked the feel of the water splashing back up on her behind, and began using the next closest bowl (our sink) to do her business. Instead of fussing with retraining or scolding, I promptly went back to a litter system. Through the years we have tried over 40 brands and types of cat litter, all with their own pluses and minuses- but that is a tale for another post. The one thing that universally remains a bummer in the litter system is the disposal and separation of waste. As a pet family that has had multiple cats, and expensive boxes from robotic litter domes to litter box 'tumblers' and even multi-layered boxes with rakes; we've tried it all. It's funny, really, because any human mother knows the value of being able to quickly seclude and dispose of diapers- that's why the human Diaper Genie concept has worked so well for decades. And it's about time the technology was adapted for litter systems! 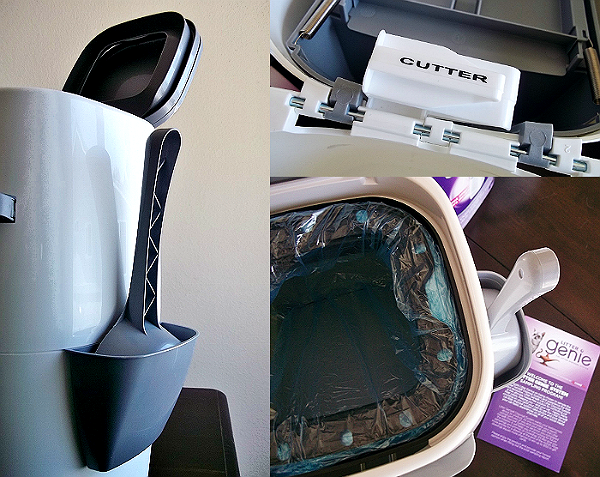 The Litter Genie is not a complicated device that promises to eliminate your handling of pet waste through micro-particalization, or a mechanical butler that takes out the trash. It is, however, pretty close to magical. For under $20 you can walk into most major retail chains and walk out with a Litter Genie system that is ready to use in 2 minutes flat, and I'd bet will change your life. In a discreet footprint that is about 1' square by 2.5' tall, this air tight receptacle comes with a litter scoop and scoop bin. Simply install the easy to use refill, by tying a double knot at the bottom of the insert bag and popping it in, then scoop you litter waste into the top compartment. Close the lid, and pull back on the sliding compartment tray, in the middle of the genie, and allow the waste to fall into a secondary air-tight compartment, below. 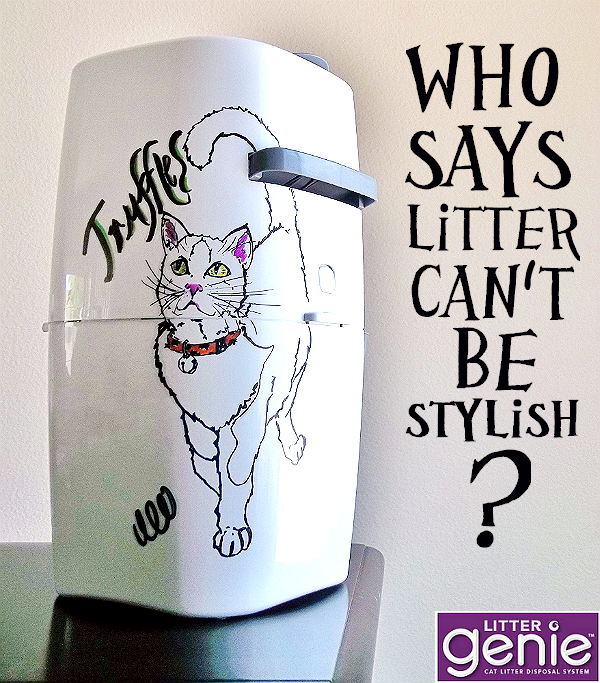 I was so moved, in fact, by out Litter Genie experiences that I have not only gifted my cousin with a unit of her own for her furry princess, but I decided to decorate ours with some love and a few Sharpies. The units really are inconspicuous, with their sleek profile and white finish, but who doesn't like to define they're pet's space just a little more? For those curious, our Litter Genie refill tends to last us about 2 months, and we change the bag 3 times a month in our single cat household. Refills can be bought in store, or online in multiple units for a fairly cheap price. I'd actually be curious to see this type of system marketed to owners of toy dogs, as I've often contemplated keeping one on the porch for when I have to clean up one of Nora's messes in a pinch! 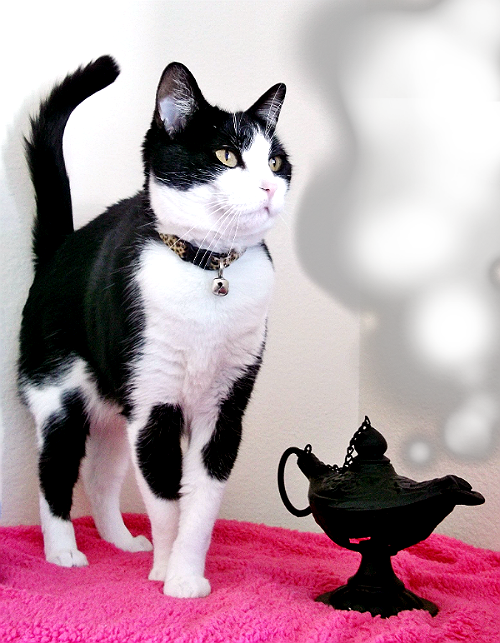 What Daughter Says: Caring for your cat doesn't have to be a chore; make litter maintenance more bearable with a Litter Genie. I love your litter genie art. Takes a commodity and makes it into art. 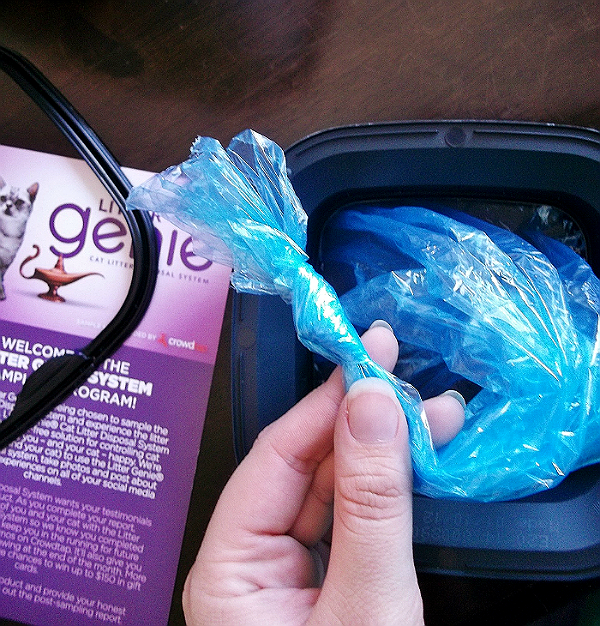 Looks like litter genie solved your cat litter box issue as well. Good for you and for truffles. That is awesome! If only they had something similar for dogs! Interesting. I love the drawing! Truffles is a cute name too. What a great drawing. When we had a cat, we would LOVE a product like this. Our cat's box is in our bathroom, and it's a huge pain to clean and take the waste outside everyday. The litter genie sounds so helpful. This is awesome! What a great drawing! We used to have a cat and I would love this! I want to get a cat but the single biggest drawback, for me, is the prospect of the litter box. We just finally got the smell out of the house from the last one (5 years ago) and I'm not ready to do it again. This might be convincing for me! Truffles is a lucky kitty. 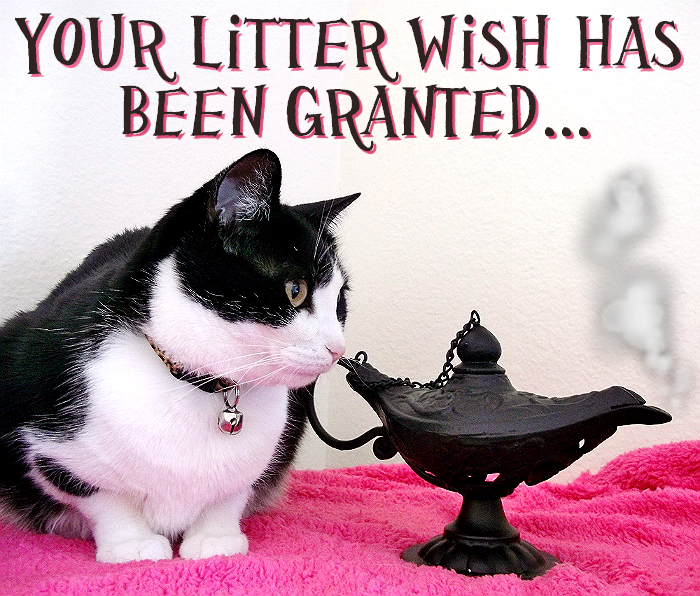 The Litter Genie sounds like a great system for keeping kitty leavings contained. 2 boxes per cat eh? Hmmmm, I don't think I could sell that to the hubby. Adding the third one freaked him out enough...10 would blow his mind. 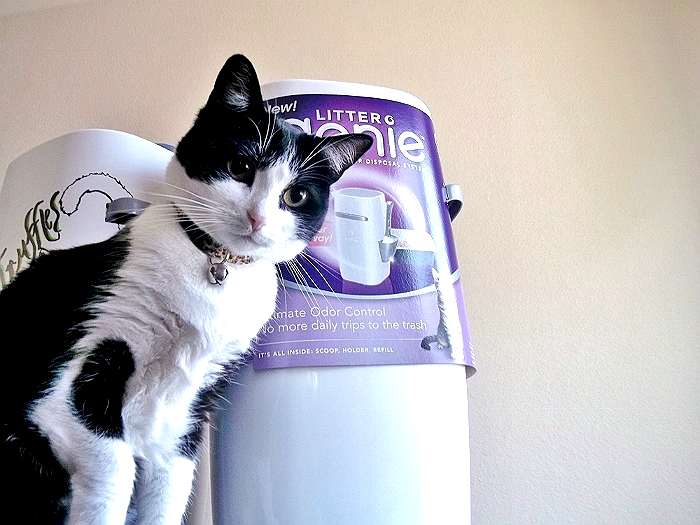 Truffles is my favorite kitty and now she has a Litter Genius to keep everyone happy.